For the thirteenth year, a jazz vespers service will be held at St. Timothy’s Episcopal Church, this year on Sunday, January 27, 2019, at 5 p.m. Kathy Tugman and the David Walters Trio will perform, along with Philip Newton (organ), Sue Ann Reinisch (flute), and Gigi Walters (piano). By now, many are familiar with this special service, structured around the lighting of a vesper candle in the bleak mid-winter. Vespers is one of the nine daily offices of the Benedictines, but, on this day, into it will be woven versions of jazz music composed by the likes of Dave Brubeck and Duke Ellington. 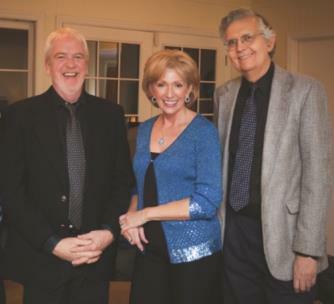 Jazz standards, such as “You Taught My Heart to Sing,” will also be cast in a new light (that of the vesper candle) by Kathy and the Trio, and, as a special highlight, Gigi and David Walters will perform a piano duet of “Libertango,” by Astor Piazzolla. Short, selected liturgical readings and recitations of poetry will add another dimension to the service. There is no admission charge, but a free will offering will be gratefully accepted and applied solely to support this annual, very special service. The great jazz pianist Bill Evans insightfully called jazz “a social situation,” that is, a gathering of musicians to explore their craft. Jazz and the vesper service itself include all of us in that exploration and call upon us to be open and receptive and to receive the joy and the sorrow, the passion and the swing, in the music. There is no teaching or homily, just listening and, perhaps learning. The descending darkness of a January evening will held back for a while.